Your school is invited to celebrate “America Recycles Day” (November 15th) this year with this FREE interactive puppet show assembly! A limited number of sponsored presentations are being offered to York County elementary schools on a first-come, first-served basis. If your application is selected, a performance will be scheduled at your school between November 5 and November 16, 2018. 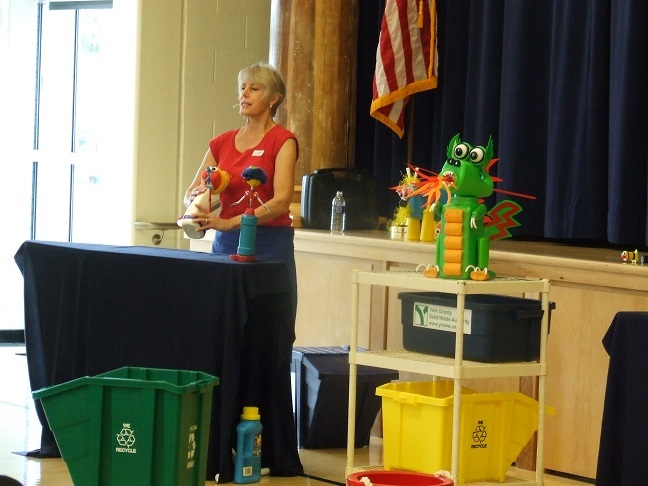 Many York County elementary schools have had the delightful experience of meeting Kathleen Jacobs and her puppet friends through the York County Solid Waste Authority’s sponsorship of this assembly program. The performance, “Magic Pots and Recycled Bottles,” focuses on the importance of recycling and the proper management of garbage. Puppets are made from repurposed common household items. Students participate in the show by answering questions and helping with sound effects. Ms. Jacobs also developed a puppet version of the York County Solid Waste Authority’s waste-to-energy mascot, “Buster the Combustor Dragon,” along with a script to spread the word that garbage is POWER! Buster has a unique construction made up entirely of repurposed materials including detergent bottles, plastic coat hangers and plastic notebooks. He is well-received by the students, some of whom get to dress up in dry scrubber gear or vacuum fly ash in an imaginary depiction of the York County Resource Recovery Center’s air pollution control system. This 45-50 minute assembly is appropriate for students in grades 1-6, although kindergarten classes have also attended. Kathleen Jacobs performs on a floor or elevated stage for up to 200 students. To apply for the assembly, submit the application by October 1, 2018.